Lemon zest adds a sharp, bright flavor to these easy kabobs. "Mix and match your favorite fish and vegetables with this easy, healthy summer entertaining recipe," says chef Adam Geringer-Dunn of Brooklyn's Greenpoint Fish & Lobster Co. He recommends asking your fishmonger for domestic, wild-caught shrimp and using a meaty fish such as swordfish, monkfish, tuna, or halibut. Soak the bamboo skewers in water for one hour to prevent them from burning on the grill. Combine olive oil, garlic, lemon zest, ¼ cup parsley, and a pinch of salt and black pepper in a bowl. One at a time, toss the tomatoes, peppers, mushrooms, zucchini, and onion in the marinade. Once evenly coated, organize them into their own small bowls. Then do the same with the shrimp and two types of fish. Cover with plastic wrap and let marinate in the fridge for 30 minutes to an hour. Discard remaining marinade. Pre-heat a clean grill to high heat (15 minutes). Meanwhile, let guests build their own skewers with alternating pieces of fish and vegetables. 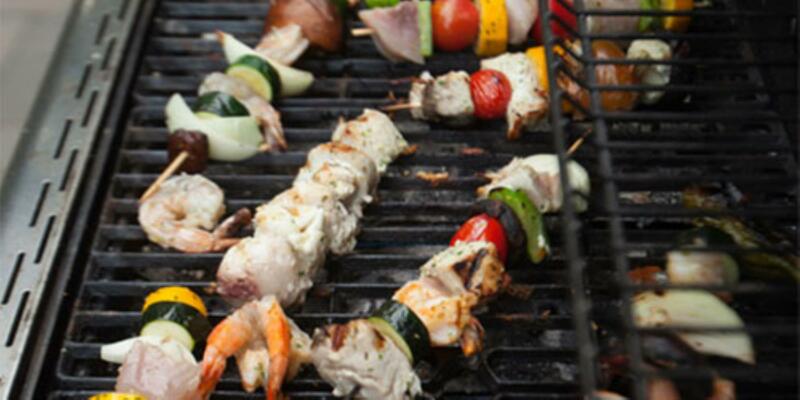 Place skewers on the grill with enough space so they are not touching. Grill for two minutes per side. Remove from grill and place on a platter. Drizzle with a little more olive oil, a squeeze of lemon, and garnish with remaining chopped parsley. Serve immediately.